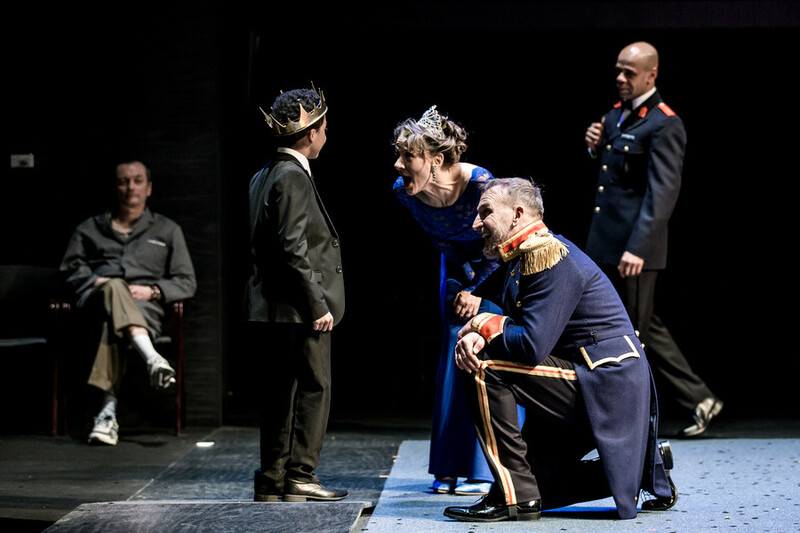 A deep love of horror movies permeates Polly Findlay’s staging of Macbeth. This is an approach that makes sense – it is, after all, a play full of hauntings and steeped in blood. Findlay sets out her stall from the beginning. 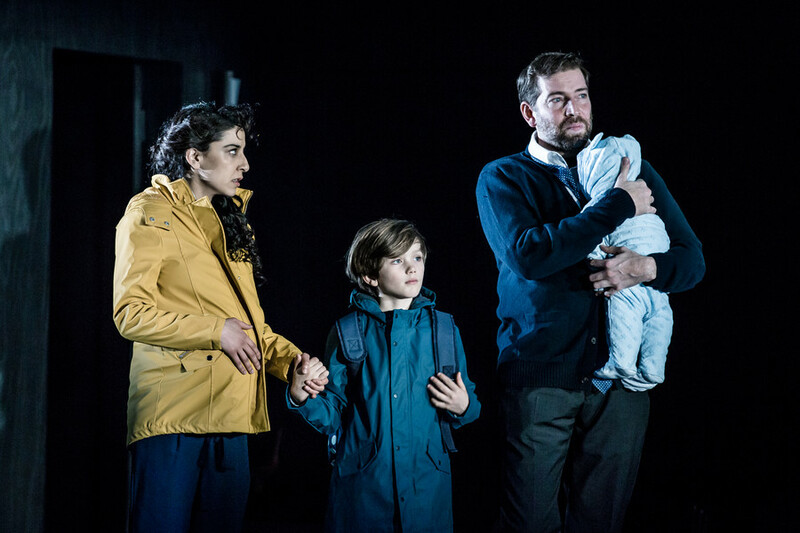 A trio of mini-witches – three young girls in hooded crimson onesies, each cradling a creepy doll – foretell Macbeth’s fate in eerie tones reminiscent of the twins in The Shining. Lost children abound in Macbeth, the dead and never-born, so it seems fitting that the witches manifest in this way. 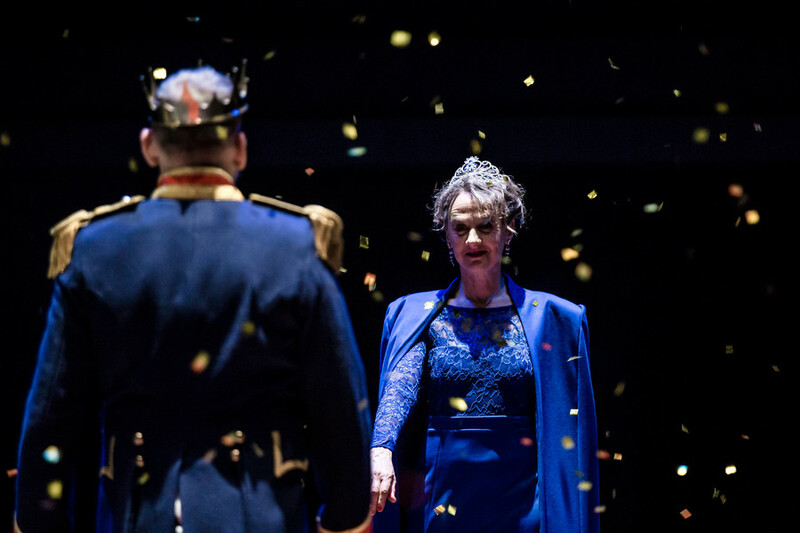 Making his Royal Shakespeare Company debut, Christopher Eccleston is an engagingly no-nonsense Macbeth, a restless returning soldier, commanding but also grounded, at ease with his peers, in thrall to his wife. He frequently kneels or crouches while she stands over him. 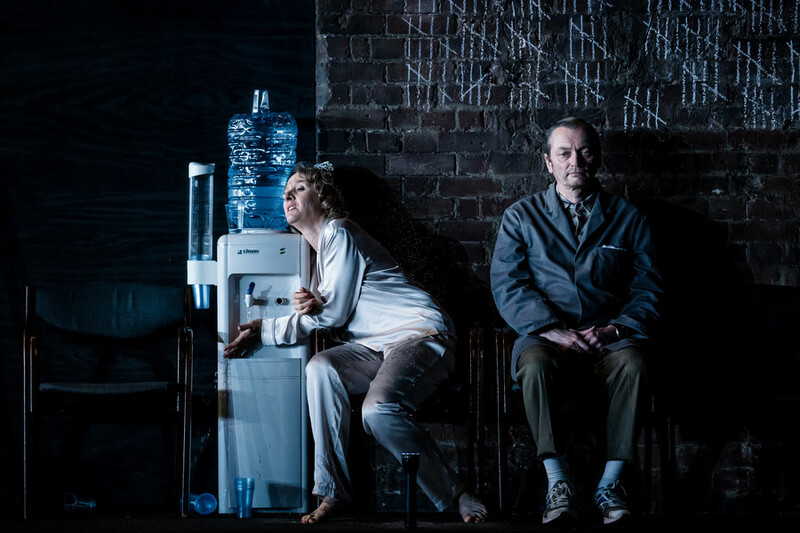 For her part, Niamh Cusack’s Lady Macbeth crackles with pain and frustration at the limitations placed on her, by society and her body. She stalks around the stage in her emerald dress, hobbled by high heels, revelling in her role, as woman, as wife, yet simultaneously bucking against it. Her impatience is palpable; after Duncan’s death she briskly snatches the daggers from her husband’s hand when he falters. 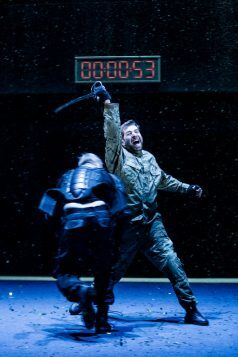 Findlay’s production makes it abundantly clear that from this moment, the clock is ticking for them both. Indeed, there’s an actual clock, a red digital display above the stage, counting down the minutes. Also marking time is Michael Hodgson’s reptilian Porter. He hovers on the fringes, pushing his red mop about the place, keeping a tally of the dead on the wall. Hodgson and Findlay have a lot of fun with the idea of the Porter as minion of hell. The scene when Macduff comes a-knocking borrows from The Haunting (Robert Wise’s 1963 version, the only version worth watching) – an ominous force demanding entry. Though the production is often very far from subtle – Lizzie Powell’s lighting fizzes and flickers and there are bits of Rupert Cross’ score that would not feel out of place in one of the Insidious films – it doesn’t just trade in thumping jump scares. 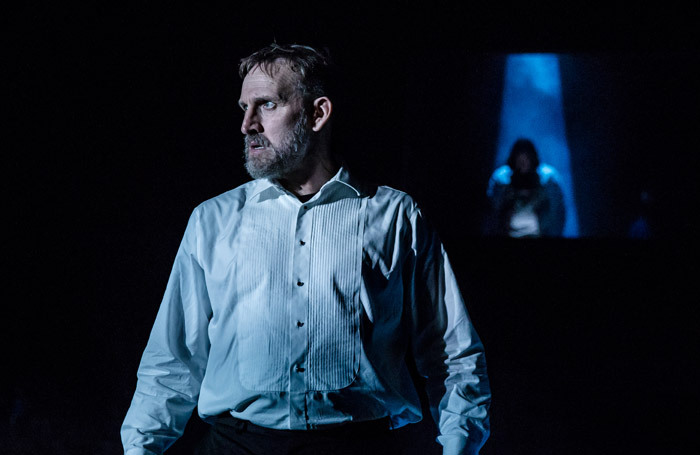 There’s a tender and knotty quality to Eccleston and Cusack’s relationship, and the moment when Edward Bennett’s amiable, cardiganed Macduff realises what has befallen his family is quietly devastating. The scene where a bloodied Banquo ghosts Macbeth feels underpowered in comparison, an opportunity missed, and, as is often the case with this play, the final conflict lacks the tension of what has gone before, but Macbeth’s dispatch at Macduff’s hands is effectively handled. Findlay’s Macbeth is one of energy and clarity. It’s playful, accessible and funny when it needs to be – and Eccleston and Cusack make a gripping central couple, their love blackening as blood does when it dries.